Patches of a powdery, off-white substance appear on the upper (and sometimes lower) surfaces of leaves and can merge to cover the entire leaf surface. Similar fungal growth may also be found on stems, buds and, occasionally, flowers. The leaves may turn yellow or purple and eventually curl, wither and fall prematurely. Affected buds may fail to open. The fungal growth on the stems may become thicker, particularly around the flower sepals and around the prickles. The mildew may turn a brown colour as it ages. 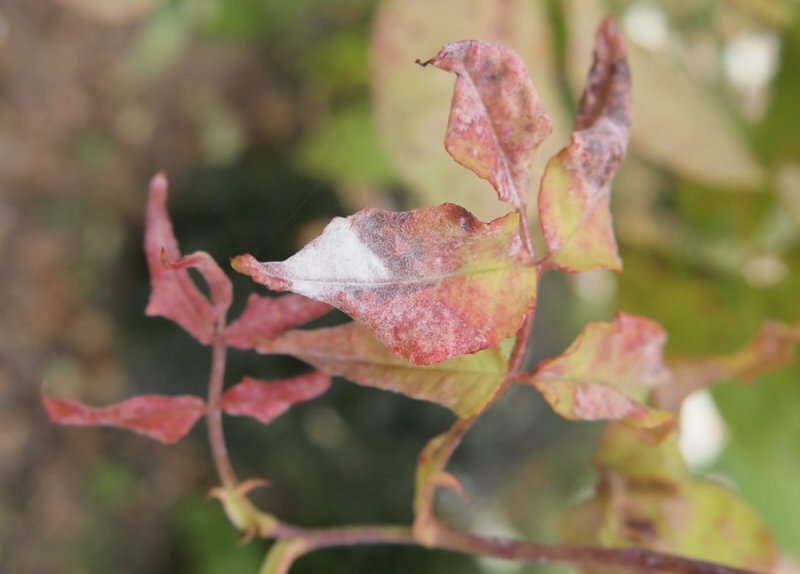 As well as being unsightly, rose powdery mildew can weaken the plant, causing wilting and early leaf drop. 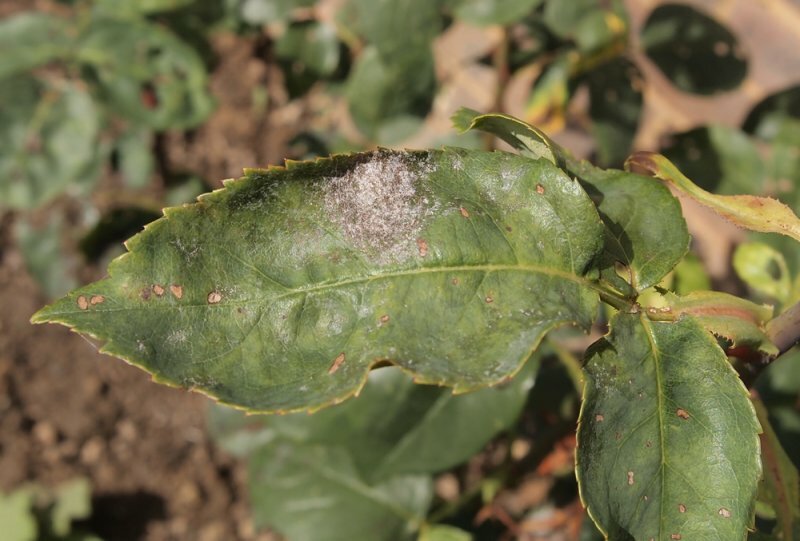 Rose powdery mildew spreads readily as the mycelium (the powdery white coating) produces conidia which are blown by the wind to infect other plants. It persists over winter by producing spores (although these only survive the winter in warm climates) or by the white fungal coating persisting on stems or in dormant buds. This is a very common disease of roses, most often found on roses in dry, sheltered spots, such as against walls. Generally found from May through the summer months. Some strains of the fungus can also infect Prunus species. Generally, older roses are more susceptible to rose powdery mildew than modern bush roses although some, such as Albas and Rosa rugosa, are fairly resistant to the diseases. As rose powdery mildew thrives in dry sites, mulching well with an organic mulch from spring and watering well in dry spells can help to retain moisture in the soil. Avoid using nitrogen rich fertilisers which will encourage the type of soft growth which rose powdery mildew tends to attack first (proprietary rose feeds are usually fine to use). Ensuring good air flow around and between plants should also reduce the spread of infection as the fungus grows best in humid conditions. Fungicidal sprays can be used, which are generally quite effective against rose powdery mildew so long as they are applied correctly. Start spraying in April and spray every 2 to 3 weeks until September (although in wet seasons, or when attacks of the disease are minor, it can be applied less frequently). If possible, select a fungicide which is also effective against rose black spot and rose rust so you only need to use one chemical to deal with them all. Chemicals which are effective against rose powdery mildew include difenoconazole, myclobutanil and triticonazole. For organic gardening sulphur formulations and plant and fish oil blends can be useful, although their effect is usually short term. Badly affected stems should be pruned out. If possible, gently wrap the stem in cloth or plastic before removing it – that way you will minimise the spread of the mildew as you’re cutting it out.